I’ve heard people say the burger craze has peaked in this town. I don’t think so. Numbers don’t lie. My burger posts on Facebook, Twitter, and Instagram are still the most commented upon and liked. The hunger for eating and reading about grilled ground beef on a bun appears to be widely shared. 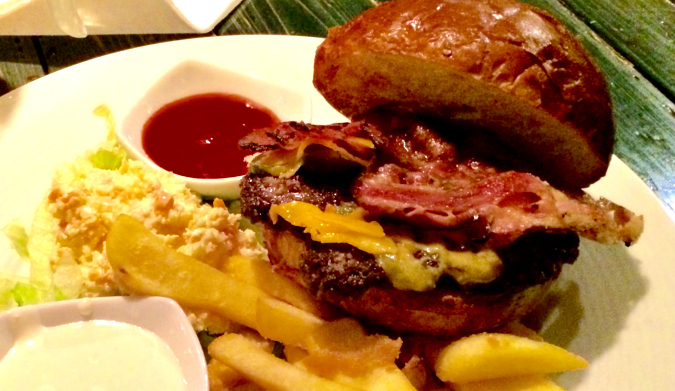 What follows are the 26 burgers I ate over the course of 2014 – the most ever. Eleven have been never ranked before. Some well-known burgers I’ve listed in the past, like those from Bohemia Bagel, Blackdog Cantina, Krystal Mozaika Bistro didn’t make it this year. I eat a number of these artery-cloggers more than once. I can’t add burgers without dropping a few. If the burgers got better, worse, or changed significantly the week after I was there, that’s too bad. They are rated as eaten. 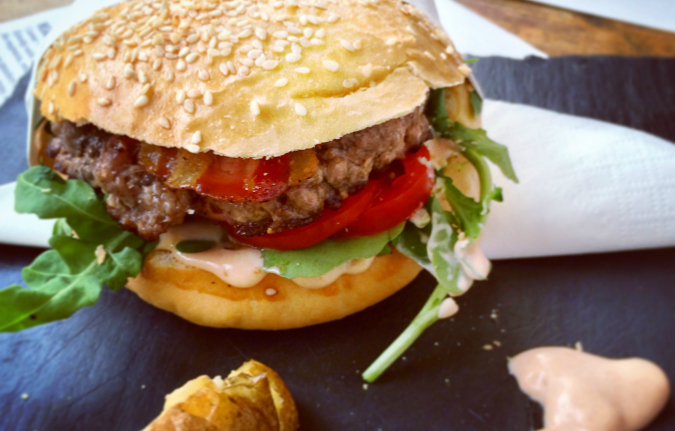 As always, I repeat my standard disclaimer: This is not a list of Prague’s “best” burgers. It is a subjective survey of the ones I either liked or disliked, based on my personal taste. What’s my taste? I prefer beef flame-grilled or with a seared crust from a steel grill, cooked medium, seasoned with salt, light pepper, and classic, American-style construction and toppings. I like my bacon lightly crisp. I’d rather not have the toppings on the bottom, where they get hot and soggy. A bun can make or break you and it broke a few this year. The right grind of beef, coarse, not too fine, with a fat content about 20 percent, is key. This Belgian restaurant’s mussels and beer have pulled in big crowds since it opened in March on Náměstí Míru. 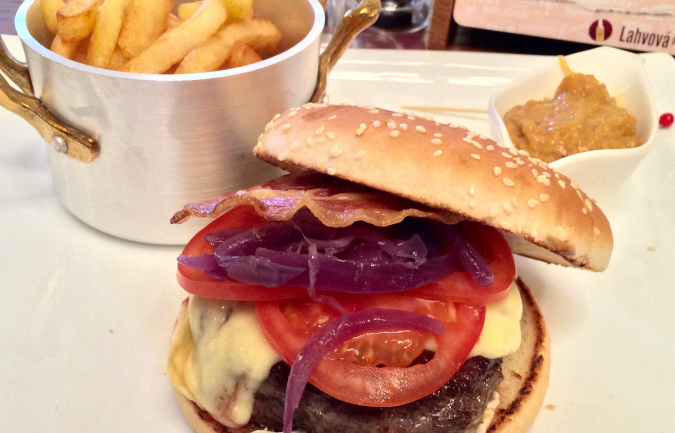 The website says its Belgian Beef Burger is made with “mature beef, au gratin with Brugge old cheese, served with grilled sweet onion, our chilli mayonnaise, home-made Bruxx fries and crispy bacon.” When I had it the week they opened, there was honey mustard sauce, a buttery-tasting cheese, tomato, and red onion. The reason I disliked this burger the most: the texture of the meat. It was more like a meatloaf than straight ground beef. 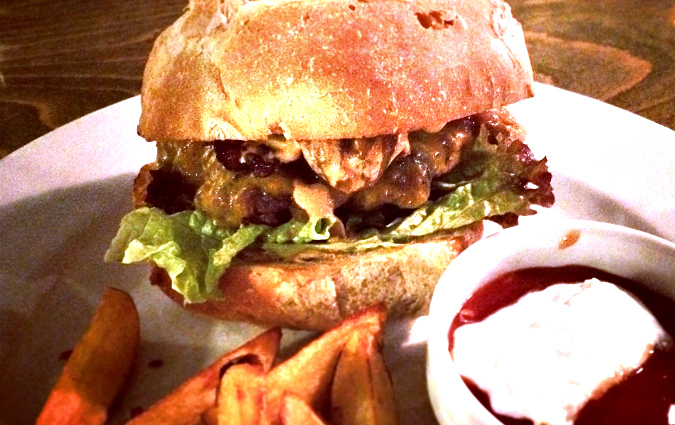 When I had it, the burger was 195 CZK. The website now lists it at 229 CZK. The fries were short and stubby. I can only hope they improved it when they raised the price. My advice based on this version is to stay with the Belgian classics. This place won the top prize at the 2013 Prague Burger Fest, which its owner incidentally organized. 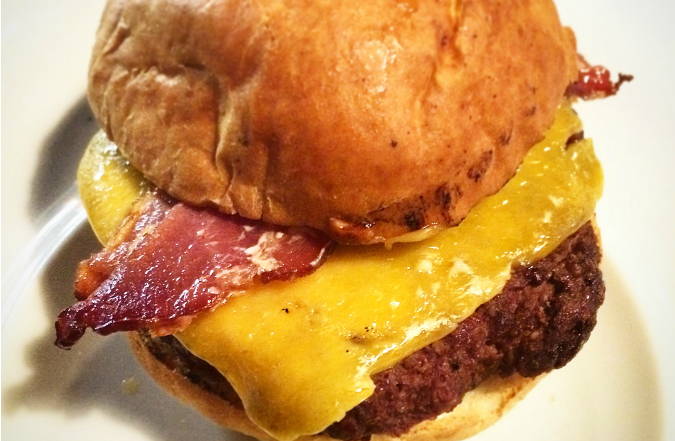 On my last year, Bejzment’s bacon cheeseburger came in sixth out of 23 burgers. So this one wins the award for the biggest fall from grace from last year. I was stunned when it arrived at my table within 5 minutes of placing my order. I questioned whether it was mine, but was assured that it was. It was barely warm. I ordered it medium, but the thick patty was rare. The quality of the meat was good, but it was bland and called out for salt to bring up the flavor. The cheddar was good and there was excellent crisp bacon. However, there was only one strip. It came with a mayo-ketchup mix, plus pickle, onion, tomato, and dark lettuce, which I do not favor. The big bun was too bready. By the time I was half way through, the meat was cold. It was very cheap at 139 CZK. Fries were 40 CZK and the greasiest of the year. I was asked if I wanted barbecue sauce, but was not told it cost 25 CZK extra. I’ve heard comments criticizing Bejzment for inconsistency regarding quality – sometimes very good, sometimes very bad. That’s been my experience as well. For social reasons, I’m often at this busy restaurant. But I don’t often get the bacon cheeseburger. The grind is usually too fine and they consistently overcook the patty to the point of dryness. If they paid more attention to patty and cooking temperature, they’d really come up in the world. They have a much-improved bun. I had one good burger there, but all the others were disappointing. It came with smoky, crispy bacon, decent cheese, Wigwam sauce (ketchup mixed with chili sauce), and not much else. It was not large and holds together. 169 CZK. 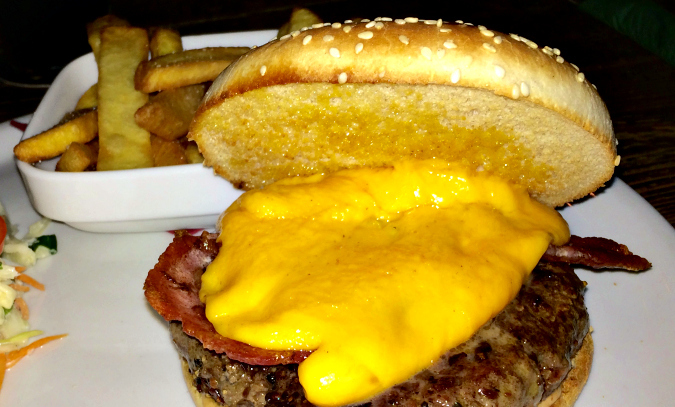 Hard to believe, but this restaurant’s burger was my favorite in 2011. Times have changed. The very salty cheese didn’t taste much like cheddar and was melted all over the place. I recall thinking years ago that their cheddar was very good. The beef had a good medium grind, but the thick patty had an odd flavor. I spent the meal trying to put my finger on what that flavor was, but I could not. Whatever it was, it was not right. It was also a very “wet” burger, with copious amounts of liquid squirting out on the first bite. 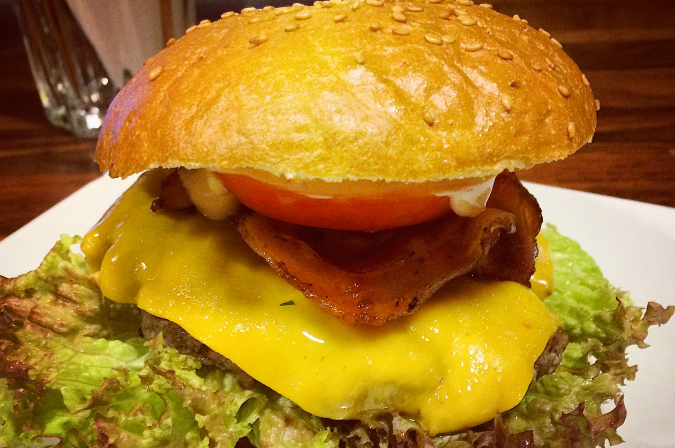 It came with crispy, salty bacon, lettuce, tomato, and onion under the patty. The veggies got warm and soggy under the meat. The bun was chewy and dry and the whole thing fell into pieces. I didn’t finish it. My notes say, “bleh.” 195 CZK. Many times, I’ve given this diner-style Vršovice restaurant a chance. They’ve regularly blown it by overcooking or undercooking their burger. This year, at least the burger came medium-well instead of the medium I ordered. It was not dry as it was in previous years. It was thick and the meat was bland. I added salt. It came with lettuce, tomato, red onion, semi-soft, smoky bacon, and cheese that did not taste like cheddar. It sat on a toasted, too chewy sesame roll. There were dishes of really tasty chipotle mayo and also ketchup on side. I strongly dislike these small servings of ketchup. There is never enough to both top my burger and dip my fries in. Overall, the burger was large and hard to bite, but held together. I felt bored, but finished it. 159 CZK. 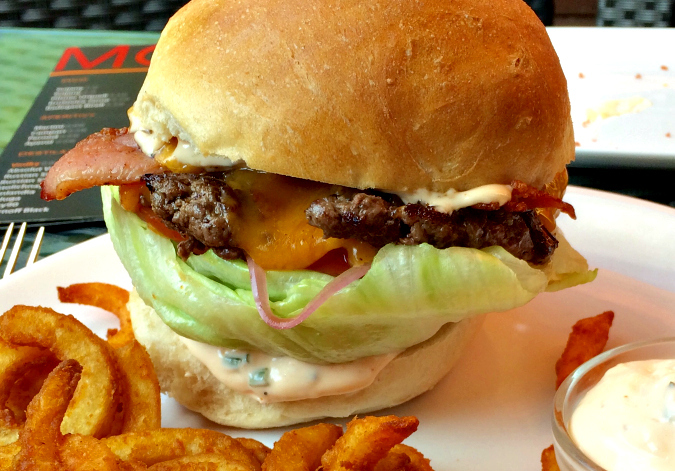 I was a fan of the the old Mozaika restaurant in the same location and ranked its burger pretty highly. I was looking forward to the results when they announced they’d become a dedicated burger joint. So it pains me to say that I did not like the Mozaika burger several weeks after they opened. Other reviews have been mixed. I come down in the thumbs down camp. It came with bacon, pickles, lettuce, tomato, good Swiss, smoky bacon, and an overabundance of homemade mayo. The ground beef did have a nice char flavor from the grill, but the grind was too fine. The meat had a mushy texture. It was cooked medium as requested. The crunchy bun was heavy and dense and became soaked with juice from the patty. It reminded me of focaccia. I thought it would be a better dinner roll than a burger bun. The first bite tasted good, but I had had enough of this burger about halfway through. 195 CZK and 49 CZK for potatoes. Another past winner laid low. 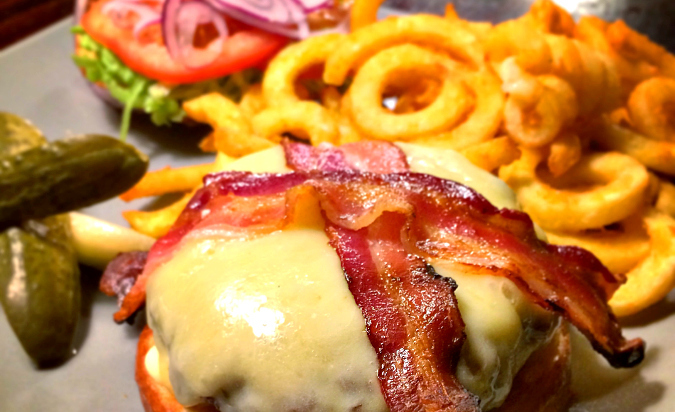 The Mood Classic Burger comes with smoked cheddar cheese, crispy, thick bacon, lettuce, tomatoes, sweet onion, tartar-style mayo, and curly fries. It came with way too much lettuce, most of which I removed, and also too much mayo. The baked roll was chewy. It came rare instead of medium and was too large to bite into easily. They ground the beef much too finely, rendering the texture mushy. And yet there was also some gristle in there. My notes say “not fun.” I will add that I like a lot of other things on their creative menu and their back terrace is terrific in the warmer months. 230 CZK with curly fries. Despite being a chain, I’ve liked this burger in the past. But I felt that this year, it wasn’t as good as it used to be. Some others told me they also thought the quality dropped. 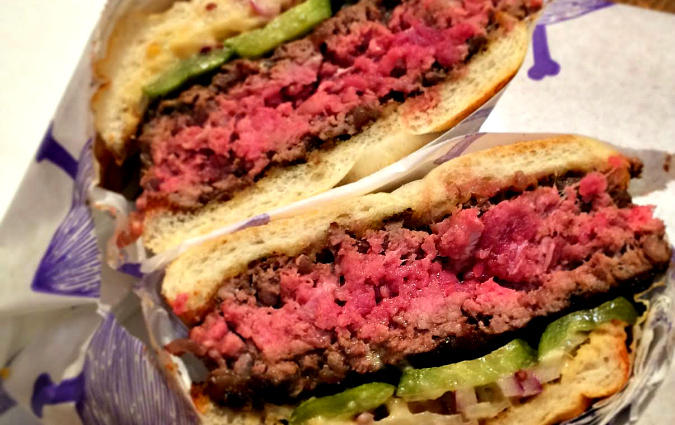 It came with red onion, tomato slices, onion, green and dark lettuce under the patty where it gets warm and wilted. The lettuce fell out of the toasted bun. There was crisp smoky bacon. The very salty but indistinct cheese picked up some of the smoke flavor. The large, char-grilled patty was big, hard to chew, and dry. I asked for medium, as always, and it came well done. This burger was huge. Without exaggeration, my jaw muscles got tired. I did not finished it. 269 CZK (295 CZK at the Na Příkopě location). Yes, I’d rather have this burger than any of those before it in this survey. Burger King is included every year for several reasons. This is my version of a “control.” It’s a known quantity and quality that most people understand. It’s burger science, if you will. The main point is this: if I like a BK burger more than the offering at a real, full-service restaurant, the owners and cooks should seriously rethink what they are doing. Another reason for its inclusion is to annoy the humorless people who take these things too seriously every year and think of this as a “best of” rather than a “favorites” list. 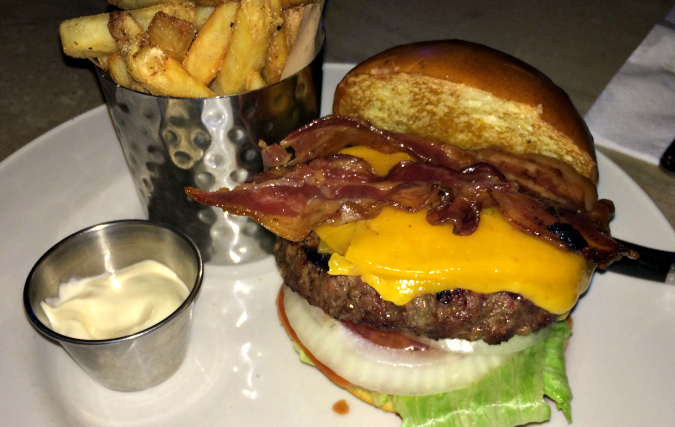 That said, this year I had the Angus XT Bacon Cheeseburger, and it was the best I’ve had from them in a long time. The burger was very well put together. 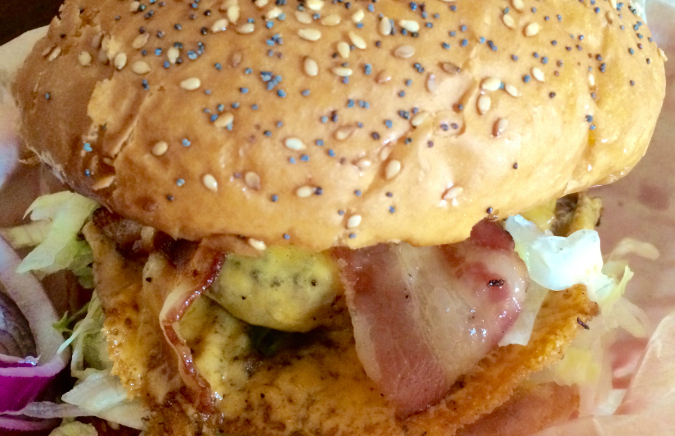 The bacon and cheese both picked up the smokiness of the extra thick Angus beef patty. It was well done, as all BK burgers are, but easy to bite into and chew. The soft bun held together but was a little too bready. There was a tangy barbecue sauce. Unlike last year, I actually enjoyed this one. 149 CZK without fries or drink. 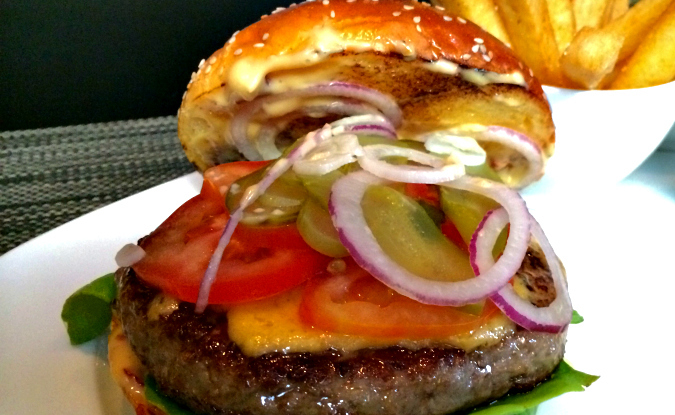 This burger was satisfying in a home-cooked burger kind of way. It was good that they replaced the ciabatta they used to use with a round bun. It cames with bacon, cheese, barbecue sauce, and lettuce. It was pretty messy. The issue for me was that the patty had a somewhat rubbery texture. It’s always been that way. I’m not sure if it is from the grind or if they mix the beef with something else. I should add that although the burger doesn’t rank very high with me, this restaurant is one of my top favorites in the city. 165 CZK with homemade potato wedge fries. 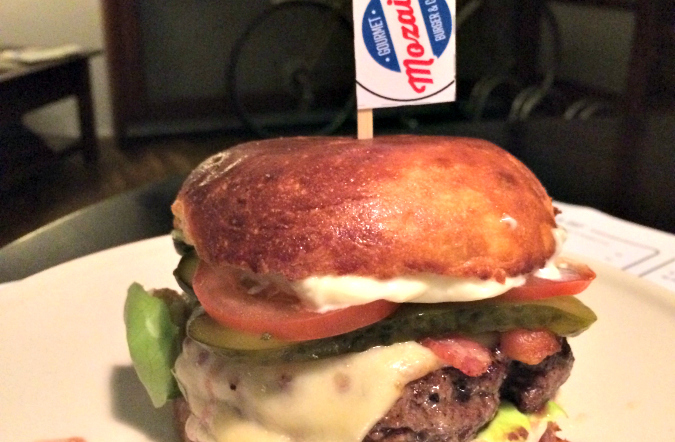 Last year, the GPS Burger did well, coming in fourth. This year, I thought they screwed it up. Only on the bar menu, it comes with red onion, pickle, tomato, lettuce, spicy chipotle aioli, and dull cheddar, mostly on top. The bun was good and held together well. The problem was one that I’ve seen far too much of this year. They took 30-day aged USDA prime beef and ground it into a fine puree. That’s just wrong. You can see the result in the edges that were too smooth and rounded. The texture of the 170 gram patty was mushy. Even so, the well-salted, overly ground beef tasted pretty good. The standout star here was the perfectly-cooked, smoky, sweet, and salty maple-glazed bacon. Wow. I’d love to just have a big order of that. I have yet to try their 900 CZK steaks, but it’s on my “to do” list. 375 CZK with very good fries – the most expensive this year. The menu changed after my visit earlier this year. 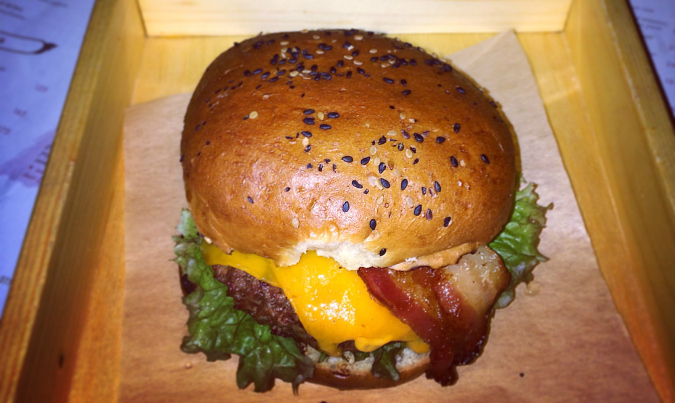 They now have exotic offerings like the Mexican beef burger, the Samurai chicken burger, and the goat cheese burger. 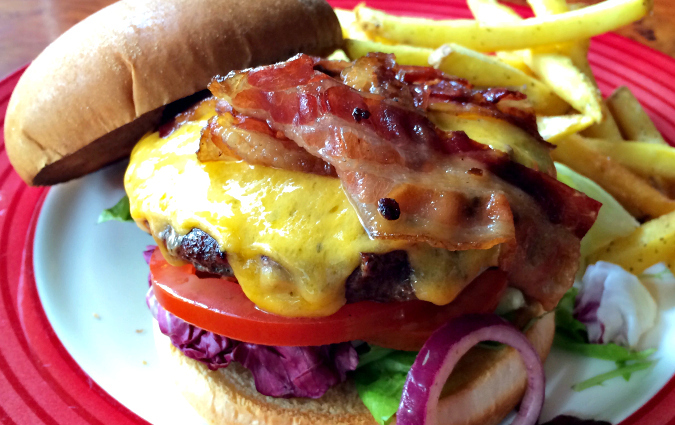 Online, I didn’t see a classic bacon cheeseburger like the one I had. That one came with very good ground beef cooked medium. The patty was on the small side. There was also bacon, cheddar cheese, caramelized red onions, shredded lettuce, tomato, soft, smokey grilled bacon, and garlic mayonnaise. The cheese all but melted away. The stumble here was the homemade bun. It was too doughy and dense, too tall, and hard to bite. It dominated the flavor of the burger and sat like a rock in my stomach. I spoke to the manager about it. If they changed the bread, it would be a major improvement. I paid 190 CZK for my burger, comes with fries. I’d heard good things about what the menu bills as “Our Smokey Burger.” It was decent but not exceptional. This burger was large. 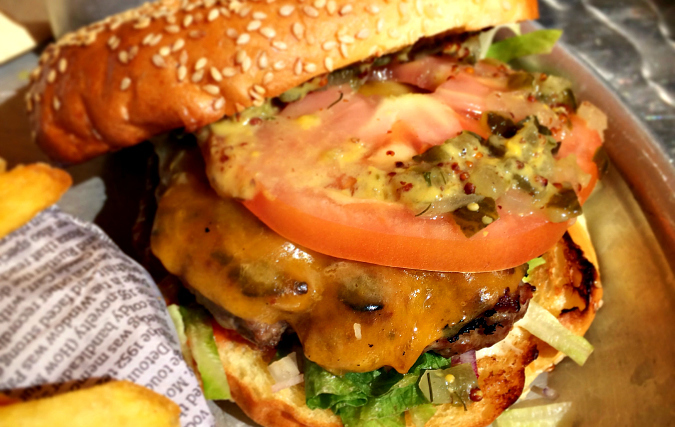 The patty was made with very peppery, good-quality ground beef and it was cooked medium. There was honey-mustard sauce underneath, which was strange to me. There were sweet pickles and tomato on the side, along with slaw, but nothing else. The toasted bun was stiff on the outside, softer underneath. The big defect to my mind was the so-called Irish cheddar. This big, yellow glob on top was rubbery and dull. The burger itself costs 229 CZK but they then charge 35 CZK to add bacon (which I liked) and 35 CZK to add the offending cheese. That pushes the total price, according to the web menu, to 299 CZK. My notes say it was 269 CZK when I had it. I like this cute little place and went there often this year. The bacon cheeseburger was not easy to get my mouth around due to its size. It came with dark lettuce, tomato, red onion, cheese, mayo, and crisp bacon. The big soft bun had a unique Worcestershire-based sauce that soaked into the bun. The patty’s grind was good, and it was quite thick. The ground beef was peppery, which seemed appropriate given the name of the place. 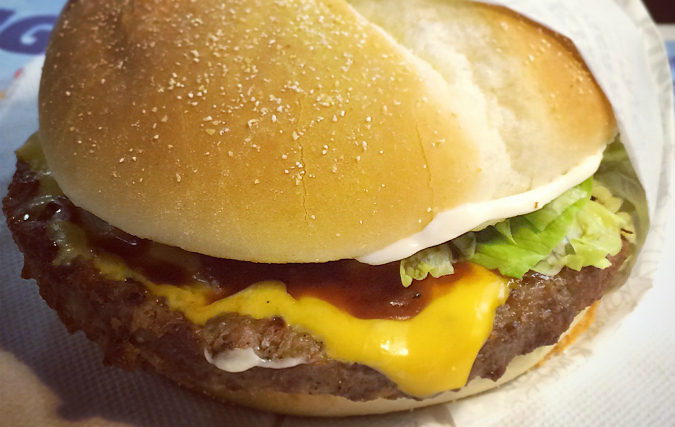 The bun became soggy with the sauce and beef juices. On one visit, the cheese tasted cheddary, but on a more recent trip, it had a more buttery flavor. It was cooked medium well. 149 CZK, no fries. Given the choice, I prefer their excellent cheddar hotdog and a bowl of their homemade soup. It took a strong recommendation from a friend to get me to leave the comfort of Prague 10 and trek to the wilds of Nebušice in Prague 6. I went by car, though I’m told buses go there. It’s a unique place in the basement of a hotel and connected to a bowling alley. 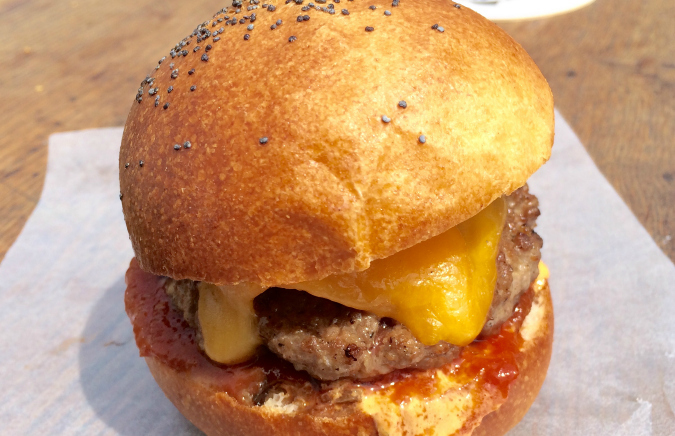 The cheeseburger came with decent cheddar that picked up the smokey flavor of the patty. The patty had grill marks on it and was cooked exactly medium. There was also sliced pickle, mustard, lettuce, and diced onion. I asked for ketchup and got a small dish, which annoyed me. The bacon was good, but there was only a single half slice, which was bad. The bun was spongy and a little too dense. 175 CZK with weak fries and a good little salad. 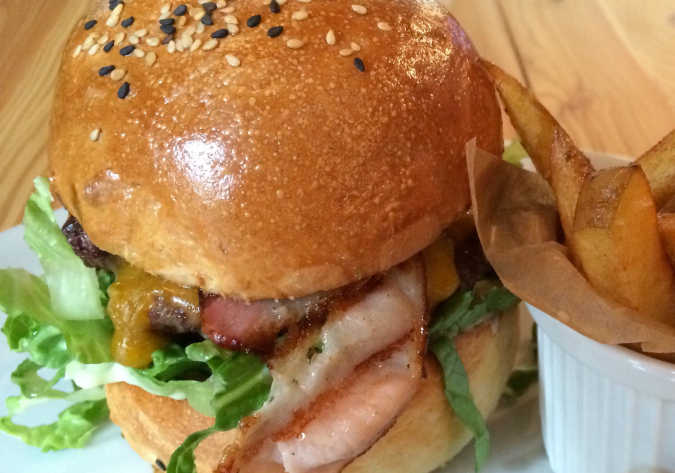 This pricey burger has remained consistently good over the years. 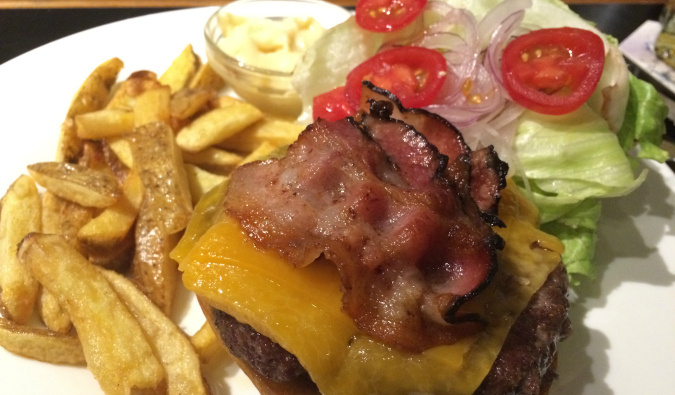 This year, I had the Big Cheeseburger with bacon. It came with thick, tangy cheddar, lettuce, tomato, and raw red onion. I thought it came with bacon, but when I saw it didn’t I added it. They serve Heinz and French’s mustard on the side. The smokey, juicy patty, a little too chewy, was served medium. It arrives on a thick, toasted brioche bun. This thing was seriously big and hard fit in the mouth. Eating it was a messy affair. It was 345 CZK. I’d actually prefer their “Classic Burger,” which has a smaller patty, but does not come with bacon or cheese. When you add those, it’s almost the same price as their big burger which has bacon and cheese included in the price. This is one of the most popular and beloved burger places in Prague. 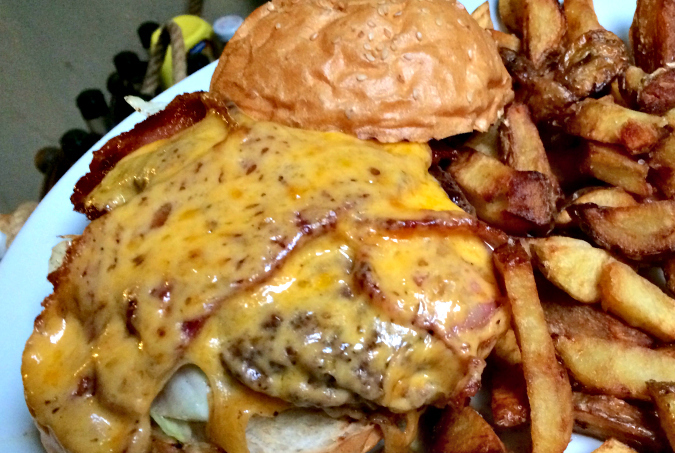 Last year, I ranked the Classic Bacon Cheeseburger #2. I’ll take some heat for this, but it dropped in my esteem. Overall, I liked it but it had some issues. The salty cheese melted off the patty and formed a hard crust around the sides. The patty, cooked medium well, was made with good beef, but it was pressed too tightly. The included combination of ketchup, mustard, and mayo overwhelmed the flavor. I say pick two, drop one. I liked the sour pickles, the three slices of crispy bacon, and the soft, steamed poppy-sesame roll. It was very sloppy to eat. 199 CZK and fries 45 were CZK extra. 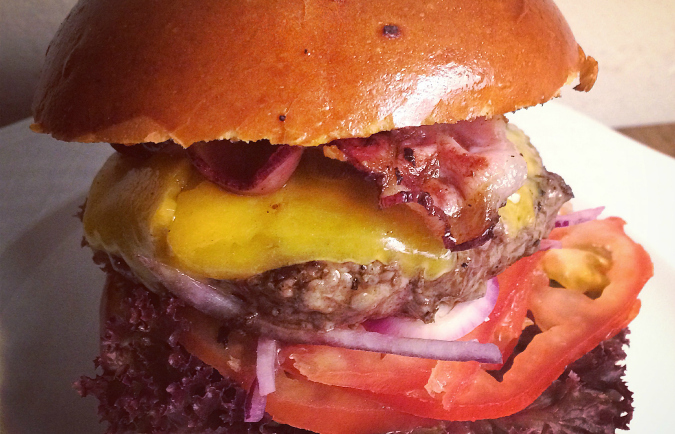 This burger has potential for greatness. I had it the first week it was available at this new restaurant. A couple of issues need to be righted. One the plus side, the 200 gram freshly ground beef patty was cooked medium and topped with white cheddar that picked up the smokey flavor of the grill. The crispy bacon was a little too charred on the ends of some strips. The grind was just right, but on the down side, there was also gristle in there. The peppery patty had a classic char crust. There was mayo and French’s mustard on top. A bottle of Heinz was on the table. The bun was too chewy and dense. I was told that a better bun is in the works. Overall, it was large and hard to bite. 245 CZK with good curly fries. Browsing the food offerings at Náplavka is always fun on a Saturday. And it’s extra good if Paul Day of Sansho fame is there with his mobile grill built into his old Defender. I had what he calls his “White Mama” sliders. It came with dry-aged beef, cured guanciale, and his homemade sauce. The bun was good. The cheese was good. It was juicy, rich, and delicious. 4. Fish and Chips 21 Dlouha St. 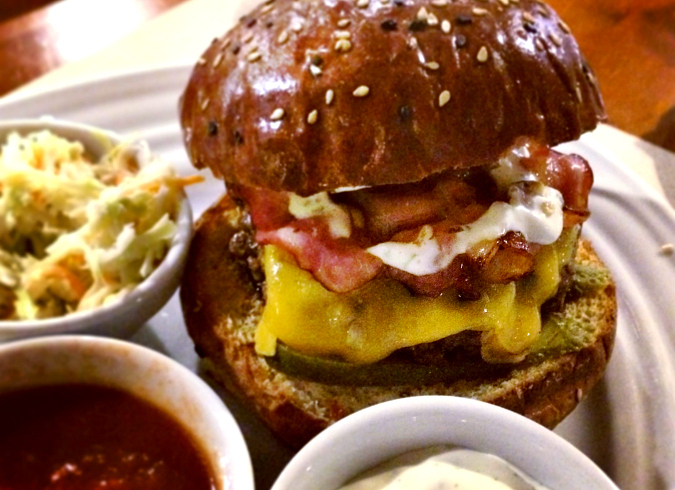 The burger was made with great beef, and it was one of the smokiest, which I love. The good cheddar picks up that grill flavor. There was lettuce, tomato, jalapeno mustard and sweet relish. They don’t do bacon. It was cooked medium. The patty, with a good course grind, was thick, but it was not wide. The bun was the main weak point here. It fell apart before I finished, but the meat was the star. 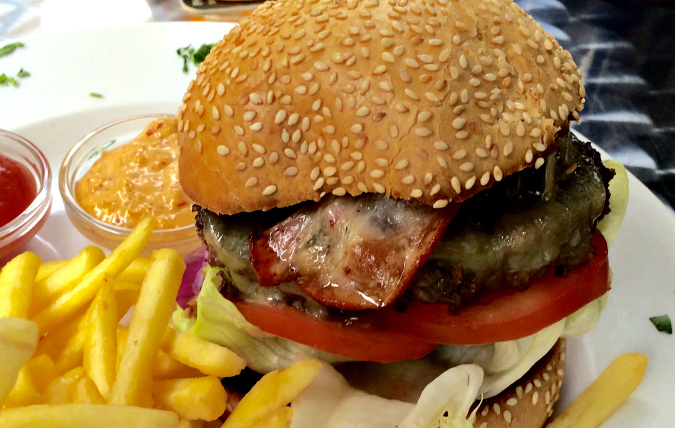 You wouldn’t expect a fish and chip shop to have a very good burger, but they defy expectations. 215 CZK with fries. I don’t like the simple, small roll they use at this butcher shop that serves a few hot meals. I don’t like that it was topped with pickles, red onion, and dijon-style mustard. What I loved, loved, loved, was the perfectly ground 180 grams of beef, cooked medium rare, with just the right fat content. The exterior had charred crust from the grill. It was moist and just juicy enough to be a little messy. It was not served with a plate, just paper. It’s fun to watch it grilled in front of you. I saw the cook in the open kitchen actually take a photo of my burger before it was served. Consider yourself lucky if you find a place to sit in this tiny place. The burger was not large, but it doesn’t cost a lot either. 125 CZK, no fries. I had the burger here a couple of years ago and did not like it. I was told it had changed and was urged to return. I’m glad I did. The Royal Bacon Cheese Burger was excellent. It came with bacon, caramelized onions, lots of garlic mayo, cheddar, and long slices of pickle on bottom 199 with fries. The thick, beefy 170 gram patty was cooked medium as advertised and came on a large sesame bun that holds together well. The grind was right. The cheese was very cheddary. The crispy, smoky bacon was crisp but thin. crispy but thin bacon. I asked for ketchup and, interestingly, they mix it with a little Tabasco. I had to pay 25 CZK for it, which I did not appreciate. The burger was great and it was hard to get a table there as a walk in. 209 CZK (199 CZK a few months ago) with homemade fries that aren’t great. There has never been a two-time winner of my burger ranking list. Until now. The restaurant is too small and has been overwhelmed by its popularity. Why is Dish the place I and many others return to the most? In a word: balance. They got the most things right – the size, the textures, the flavors, the quality. 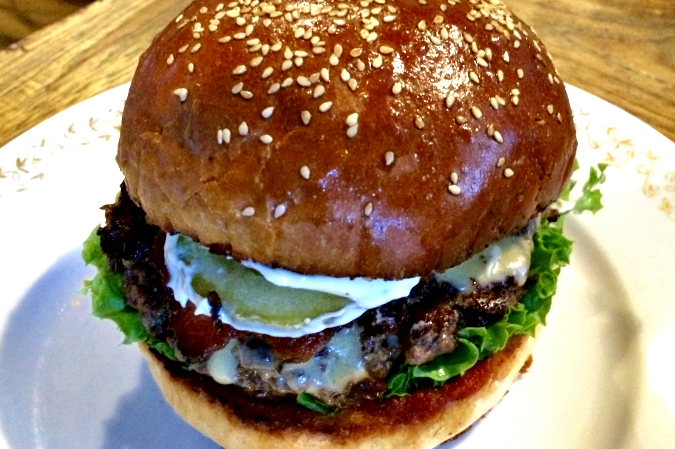 The Dish Burger was made with white, tangy cheddar, slightly crispy bacon, garlicky aioli, very sour pickles, and lettuce. There was a mild homemade ketchup. The burger was put together with care. It didn’t just taste good. It looked good. The toasted bun was soft and yet held everything together. It was not baked as it once was. Some complained they did not like their new bun recipe as much as the old. It didn’t bother me. The burger had the right grind, the perfect amount of salt, a crust seared by the grill, sealing in the flavor. There were still some chewy pieces of meat in the grind. I’m not sure why that issue continues, but I like it so much overall that I’m willing to forgive. 189 CZK and homemade fries are 45 CZK (the last serving I had were good, much-improved from when they opened). That’s my list for 2014. Feel free to agree, disagree, or share your own rankings in the comments.